Termicide are the largest and best value Pest Control and Pest Management company servicing Brisbane and the Gold Coast. Providing environmentally preferable solutions for general pests and termites using the highest quality products & services such as the Termiglass barrier, for complete pest control & management. Termicide operate across SE Queensland, including Brisbane, the Gold Coast & Sunshine Coast. Termicide have over 50 trusted Technicians and support staff that have been trained in all aspects of their role to ensure that you get an outcome that far exceeds your expectations. Our team are constatntly attending courses and keeping up to date with the most relevant standards to ensure you are getting the most advanced products and treatments. Termicide Pest Management was established in 1996 with the vision of providing the highest quality products and services to builders, home owners and Companies alike. With environmentally preferable solutions, Termicide has been rated No#1 on environmental attributes and has now overwhelmingly become Australia’s preferred pest protection supplier. Involved in all levels of Pest Management, Termicide offers the most effective protection available. Being able to respond to the individual organizational requirements of our customers, without compromising quality or service is what makes Termicide The Natural Solution. Termicide have over 200,000 successful Pest Control installations. 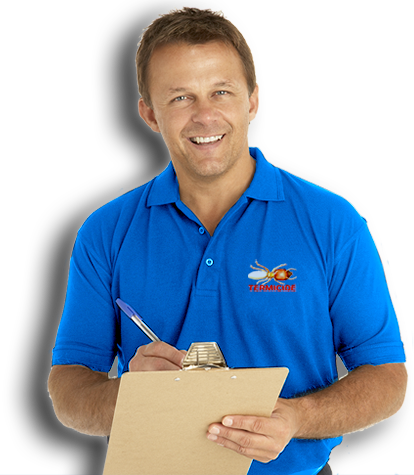 What makes Termicide the Leading Pest Control Provider in Queensland? Evaluated as the ‘best value across all pest treatment types’ according to a recent price/service ‘like for like’ comparison of competing providers. Acknowledged innovator in the local pest management industry having developed the highly acclaimed Termiglass Termite Barrier system. Trusted, Fast-Response local brand for pest control treatment. Unequalled commitment to thorough workmanship and service. Only Premium products and procedures deployed. Latest maintained equipment and highly trained technicians utilised.